and he uses his extra appendages to score in soccer. Will he stay a beetle forever? You’ll have to read to find out! 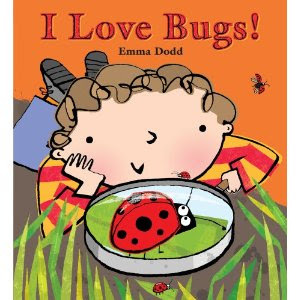 It is a lengthy picture book so I would recommend this book for ages 5+. 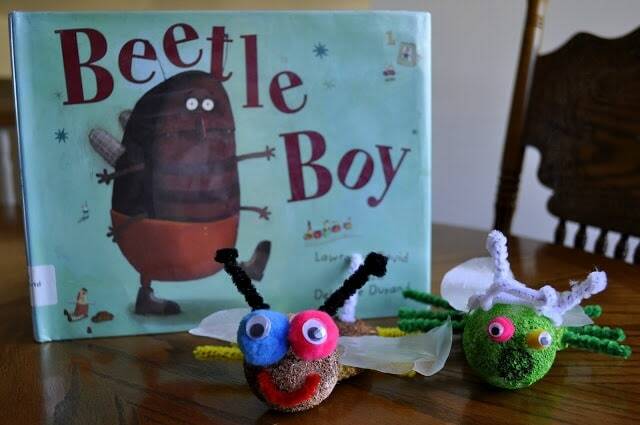 After reading this story I thought what better way to bring it to life than to let my boys create a bug of their very own. 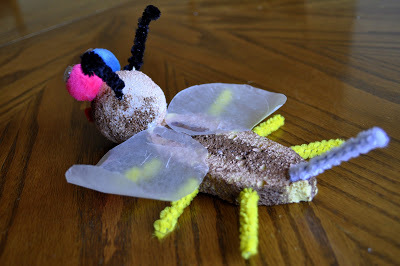 We started by talking about all the different parts on a bug (antennae, eyes, thorax, legs, wings, abdomen) and how we wanted to make sure our bugs had all those parts. 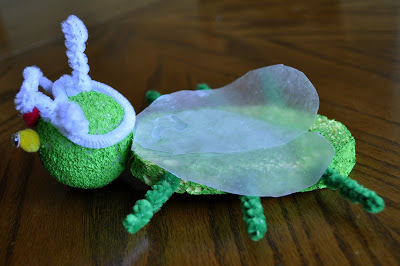 One of my favorite parts of this craft was letting my boys look through my craft closet with me picking out items they wanted to use to make their bugs. They really had their creative juices flowing! For the head they used a Styrofoam ball and painted it the color of their choice. For the body they cut a sponge into an oval shape and painted it. 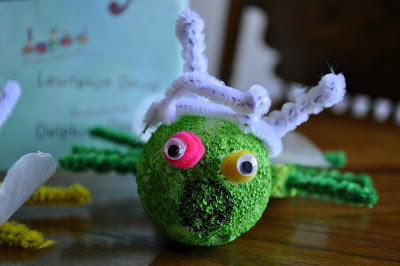 They poked toothpicks in the sponge for the legs and wrapped them with pipe cleaners. The antennae were made the same way. You can see for the face they both wanted to add pom-poms with wiggly eyes for the eyes. 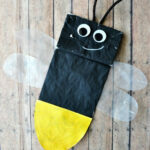 They both added wax paper wings. Andy’s is in flight, but Luke’s wings are closed. 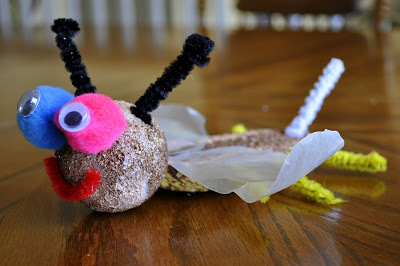 Andy also included a stinger in his and used a pipe cleaner for a mouth. They both LOVED this project!! that send the boy squealing! I like to link my posts up to THESE fun link parties. What fun and the possibilities are endless! 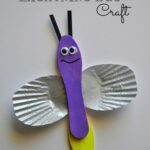 I adored this crafts once I saw it on Pinterest! It is so cute! 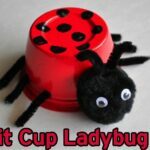 Your crafts really inspire me! I have a new Pinterest account now because I had some problems with my old, check it out if you want! Have a nice weekend!